Unisex top in soft cotton blend. Pit to hem 18". Arm from pit 20". M&S Navy Jumper With Bell-Shaped Lace Sleeves size 10. Good condition, only worn a couple of times. 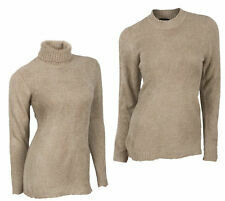 Soft, slim fitting jumper with round neck. Machine washable. I’m having a spring clear out, you may like to see my other size 8-10 items. Happy to combine postage. M&S Ladies Butterfly Jumper 18. With gorgeous butterfly appliqué effect panel to front. Edged at sleeves collar and hem in a twin stripe of plain and sparkly red. 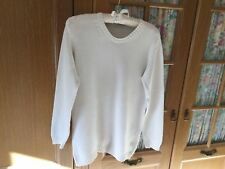 M&S White Cotton Blend Jumper Size 12/ 14 In Very Good Condition. A white cotton Blend jumper from M&S. Size 12 with the chest measuring approximately 38/40 inches when laid flat and the length from shoulder to hem is approximately 25/26 inches. In my opinion it is very good condition as it has been safely stored away. Please ask any questions. From a smoke and pet free home. Thanks for looking & please feel free to look at my other items. Happy bidding. Light weight jumper in pretty pale pink colouring with long sleeves, round neckline and cable patterning. Lovely M & S Jumper. This is a gorgeous jumper by Marks & Spencers from their collection range. M&S Jumper Black Beige Striped Size 10 - Beloved. Material - 63% Acrylic 37% Cotton. - Chunky knit. - Machine washable. - Cotton blend. UK Size 10. EU Size 38. Condition - Excellent Used Condition. Pit to pit: 16”. Length: 22”. A smart & warm top with a long matching scarf - Cost £49. M&S Autograph Ladies (Magenta) Cherry Red Cotton Blend Round Neck Jumper. Cherry Red (Magenta). 60% Cotton; 40% Acrylic. Machine Washable. IN GOOD CONDITION Cream/Black hairy pattern Cotton Blend Jumper long Sleeves Size 24 by M&S COLLECTION Underarm Size 56" Back length 27"
Ladies Smart Casual Wear Jumper. Waist Length, Knit Design. Size: 12 UK, 40 EUR. Main Colour: White. Good Condition. A quality multicoloured jumper by Per Una at Marks & Spencer. Length: 24". Size: 12 UK. It is in lovely condition with no marks or defects. RIBBED THE SLEEVES ARE THE STAND OUT FEATURE OF THIS JUMPER AS THEY ARE LACE AT THE BOTTOM WITH A DEPTH OF 9.5" THEY ARE 8" WIDE SO 16" ROUND. LENGTH 25". 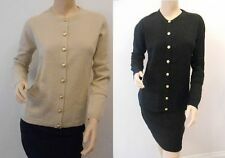 M & S Limited Edition Chunky Knit Cotton Blend Cream Cardigan/Jacket Size 18. Edge to edge style in cream with coral chevron pattern. Long sleeve cotton-blend jumper. Peach shade. 22" armpit to armpit. M&S Collection. Cosy chunky aran effect new M&S cream ladies jumper size 22. Ladies MARKS AND SPENCER Grey SEQUIN CHERRY BLOSSOM SWEATSHIRT, SIZE 10, in Very Good Condition. - TO FIT CHEST APPROX. LENGTH IS APPROX. M&S Autograph Jumper - Grey Marl - Faux SilkRaglan Sleeves. 23" from shoulder to hem. 17" across waist. Size 8, 38, 40, 4, Small. Petite Size so smaller than normal. Would fit a size 6 extra small. Very smooth and soft.Very fine knit. Marks And Spencer Size Small. Ladies Chunky Knit Junmper. Striped, Nauticul,. Marks And Spencer Size Small. Ladies Chunky Knit Junmper. Striped, Nauticul,. . Condition is Used. Dispatched with Royal Mail 2nd Class. Really lovely chunky knit jumper with 3/4 bell sleeves. I would say size 8/10 . 11" from underarm to waist, shorter length. In vgc. I AM SELLING A LIGHT GREY BOXY STYLE SWEATSHIRT WHICH IS FROM MARKS AND SPENCER AND IS A SIZE 12.IT IS IN EXCELLENT CONDITION AND COMES FROM A SMOKE AND PET FREE HOME. 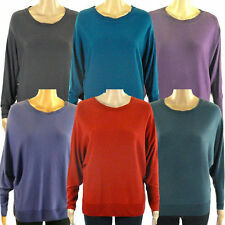 M&S COLLECTION, COPPER ROSE CREW NECK, LONG SLEEVE JUMPER, RICH COTTON CONTENT, SIZE 20 SIZE. Block, Chevron Pattern. Blue & Grey. Model is 5"5 & Wears a UK 8. Length Back 28" approx. Marks And Spencers Royal Blue And White lightweight Geometric Jumper 20. Condition is Used.some bobbling Dispatched with Royal Mail 2nd Class. Long sleeved style with crew neck, jumper sweater top style. is longer at the back with two long panels, tail coat mullet style. Really lovely on! Size UK 14, EUR 42. Fab condition, has only been worn once for a few hours. PER UNA . GOOD CLEAN CONDITION. Cream mix jumper in last lot photos to show style only! 👀👀❤️❤️❤️❤️❤️❤️ M & S Size L(16-18) Cream /navy Mix Striped Jumper-RRP £35 SALE. Fit approx size 16-18 bust. Apologies in advance for this! I can let you have the proof, if you need to make any claims. • BNWT M&S COLLECTION. LOVELY LADIES JUMPER. • COTTON BLEND. Ladies M&S red jumper, size 8. Please check out my other items, you might find something to match. Postage combined for multiple purchases, please wait for your invoice before paying if you buy more than one item. For same day postage please pay by 08:00. I do not post on Thursdays or Saturdays. Any questions, feel free to ask. All sensible offers considered, bearing in mind that postage is free. Smoke and pet free home. Hoodies & Sweats. The fabric is a cotton polyester viscose elastane blend. Style: Jumper. Denim Waistcoats. Denim Jackets. Material: Cotton Polyester Viscose Elastane Blend. Pattern: Floral. Main Colour: Grey. Material: 94% cotton, 6% polyamide. Length from shoulder to hem 25" (63cm). This lovely Ladies sweater features a rounded neckline cable detail at front, fringe edging at the bottom, and long sleeves, This Per Una jumper is perfect for pairing up with jeans or skirts this winter for a smart casual look. Black & white textured dogtooth pattern. M&S Collection Jumper.